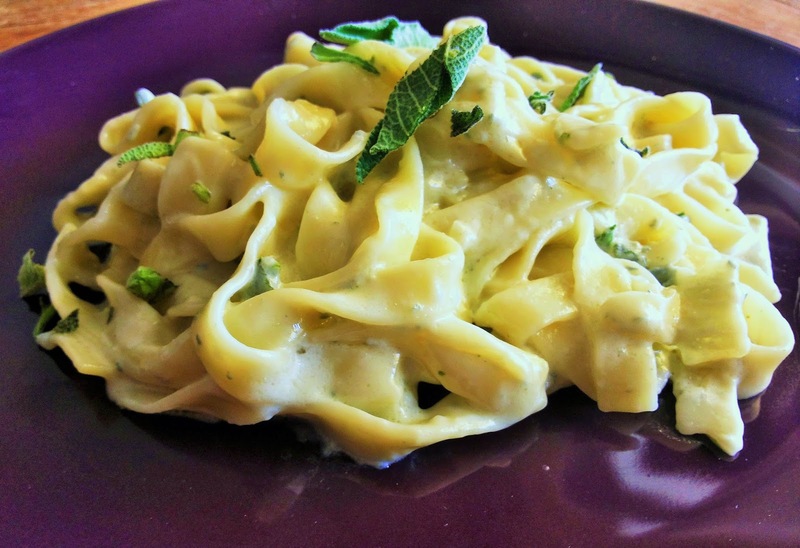 Fettuccine with Blue Cheese & Fresh Sage Any pasta will work with this sauce: spaghetti, tagliatelle, fusilli. The list is goes on. Fresh sage has a much less bitter taste than the dried form, but both fresh and dried can overpower the whole dish if used generously. 1. Cook the pasta in a large saucepan of salted boiling water according to the packet instructions until al dente. 2. Meenwhile, melt the butter in a heavy-based saucepan over a low heat. Add the crumbled cheese and heat, stirring, for 2-3 minutes until the cheese has melted. 3. Add the cream, vermouth and cornflour and whisk to combine. Stir in the chopped sage leaves. Cook, whisking continuously until the sauce boils and thickens. Season with salt and pepper. Remove from the heat. 4.Drain the pasta thoroughly. Reheat the cheese sauce gently. Pour over the pasta and combine. Garnish with sage leaves and serve immediately.